In the strange, us-versus-them Christian subculture of the 1990s, a person’s faith was measured by how many WWJD bracelets she wore and whether he had kissed dating goodbye. Evangelical poster child Addie Zierman wore three bracelets asking what Jesus would do. She also led two Bible studies and listened exclusively to Christian music. She was on fire for God and unaware that the flame was dwindling—until it burned out. Addie chronicles her journey through church culture and first love, and her entrance—unprepared and angry—into marriage. When she drops out of church and very nearly her marriage as well, it is on a sea of tequila and depression. She isn’t sure if she’ll ever go back. 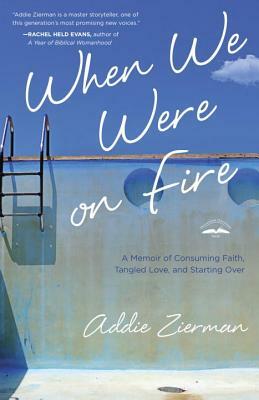 When We Were on Fire is a funny, heartbreaking story of untangling oneself from what is expected to arrive at faith that is not bound by tradition or current church fashion. Addie looks for what lasts when nothing else seems worth keeping. It’s a story for doubters, cynics, and anyone who has felt alone in church. Addie Zierman is a writer, blogger and recovering Jesus freak. She studied creative nonfiction at Hamline University and received her MFA there in 2010. Addie blogs regularly at www.AddieZierman.com where she’s working to redefine her faith one cliché at a time. She lives in Minneapolis with her husband, Andrew, and their two young sons.